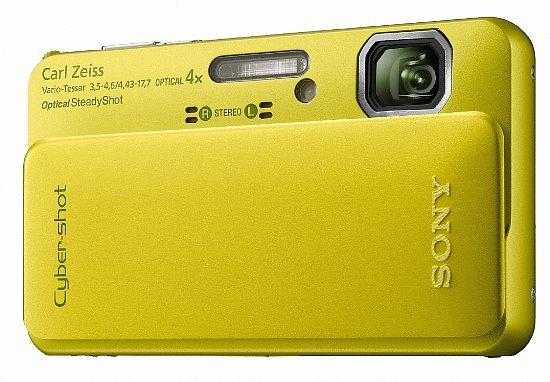 Sony's Cyber-shot DSC-TX10 costs about $50 less than the more expensive DSC-TX100V, but features the exact same 16.2-megapixel "Exmor R" back-illuminated CMOS sensor, HD movie recording, and 3D still images / panorama capabilities. And while there are a few trade offs -- no OLED viewing screen and only 1080/60i AVCHD video recording -- the DSC-TX10 is waterproof in up to 16 feet of water for an hour, shockproof up to 5 feet, dustproof, and freezeproof down to 14 degrees Fahrenheit. Most all of the newly announced Sony Cyber-shot cameras feature a 16.2-megapixel "Exmor R" back-illuminated CMOS sensor this year. It's great for low light performance and is capable of 10 fps burst shooting (for fast action shots) as well as full 1080 (60i) HD video. Sony also includes Dual Record option, where you can capture a 3-mepapixel still image while video is rolling. The DSC-TX10 is the most affordable "lifeproof" model from Sony yet, and as usual it's packed with their latest and greatest technologies. The DSC-TX10 camera will be available in silver, black, green, blue and pink this March (2011) for about $330 US.